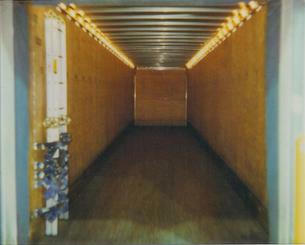 We installed 100 lights on the inside of the trailer for easy loading and unloading and just because we wanted to. Hey! This is still America, isn't it? 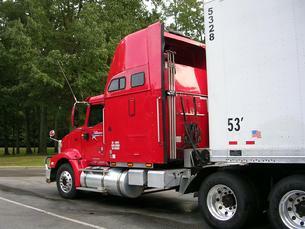 We have International's finest Eagle 9400i model tractor with air-ride seats, air-ride cabin, air-ride suspension, powered by a 500 horsepower Detroit 60 series diesel engine connected to an Eaton/Fuller 13-speed, double overdrive transmission and Great Dane's finest 53' air-ride dry van. Both are loaded with all the extras. 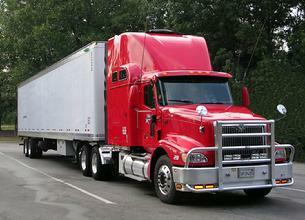 Almost all of the extras were installed on the tractor and trailer before I ever drove it. The dealer said he had never seen an owner put so much stuff on a tractor before he ever drove it and he had never seen anything like it. The tractor is factory set to run most economically at 65 mph with the tachometer at 1,500 rpms in the 13th gear. Even though, with that engine, the tractor could normally go as fast as 120 mph, with my setup, my top speed is 94 mph. I just slowly increase the speed to 65 mph, turn on the cruise control, and enjoy the scenery. We have a printer/scanner/copier, 2 laptop computers and 2 phones in the truck. 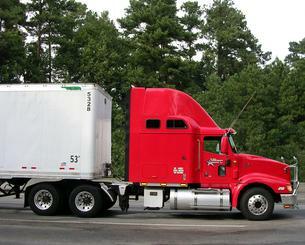 We can send and receive email and faxes from the truck. More stuff: Connex 4800 CB radio with 12 local and international frequency bands, Texas Star 667 watt linear, Uniden programmable weather scanner with extra scannable, programmable frequency bands, Centramatic automatic wheel balancers on all three axles, 300 gallon fuel tanks, an alarm, alarm pager, ignition disabled keyless unlock and start, a $3,000 "moose proof" bumper and grill with LED marker and turn-signal lights, an $8,300, 6000 watt A/C Lombardini powered diesel generator with a 70 amp alternator, A/C and heat, $4,000 worth of Camping World upgrades including a Xantrex 2,000 watt A/C inverter with built-in 3 stage 100 amp battery charger, Pathmaker battery charging group selector, home-style circuit breaker panel with many 120 volt A/C outlets just like a motorhome. 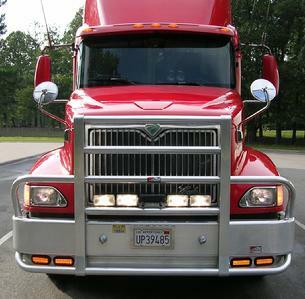 We also have the Hella headlight conversion with PIAA extreme white bulbs, PIAA driving and fog lights with extreme white bulbs, Hornet 12 volt animal avoidance system, $5,000 KVH in-motion satellite with all DIRECTV channels, 19" Sony LCD flat-screen TV, two 7" LCD flat-screen in-dash monitors, a Clarion CD/DVD/Sirius/Video deck with a USB port that will accept a thumb drive or external hard drive with thousands of audio and video recordings, two 10" Kicker sub-woofers, multiple smaller Kicker speakers and amps, a 5 foot tall, 11 cu/ft home-size refrigerator/freezer, 2 cu/ft microwave, coffee maker, and a "Sleep Number" bed. Just like a motorhome, the 4 start batteries and the 4 deep-cycle batteries are charged by the tractor engine, the generator, or the shore power cord. The shore power cord, the 2,000 watt inverter, or the 6,000 watt generator supplies A/C power for everything and, during freezing weather, when I'm parked, I can run a short extension cord from the A/C outlets in the driver's side box to a receptacle under the driver's door which supplies power for the fuel, oil, and water heaters. On numerous occasions, I have been parked in minus 30 degree weather for several days. I only ran the generator and the truck started just fine and the diesel fuel never froze. 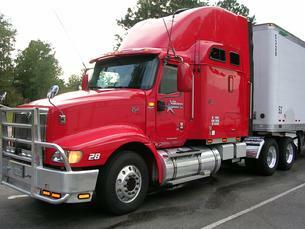 An aluminum roof, strongest wood floor and rub-rails, 102" wide, 110" inside height with swing doors, 15 logistic straps, 3 load locks, axle load gauges on the tractor and trailer, welded trailer door hinge bolts, ultra-secure king-pin lock, landing gear lock, ultra-secure locking-pole lock with internal steel backing plates, 100 lights inside the trailer and four 70,000 candlepower back-up lights outside the trailer.